Show sales saw a boost from the reduced Connecticut State sales tax on boats, according to the NMMA. The Progressive Insurance Norwalk Boat Show, held Sept. 20-23 at Norwalk (Conn.) Cove Marina, is a smaller show with around 300 boats on display, but exhibitors say it can be a productive one. Held a week after the Newport International Boat Show, Norwalk often attracts attendees who visited Newport and have narrowed their list of potential boats. Some are ready to make a final decision. Such was the case with the Formula 400 SSC. Introduced in Newport, the boat was busy with prospective buyers in Norwalk, some of whom had first seen it during the debut, says Formula executive vice president Grant Porter. This year, the Norwalk show had 14,384 attendees, down 5 percent from 2017’s 15,071 attendees. Yom Kippur fell earlier in the week this year, and the weather was overcast and cool. That said, paid attendance and children’s attendance was up from 2015 and 2016, when the show saw similar circumstances regarding the timing of the Jewish holiday, organizers say. 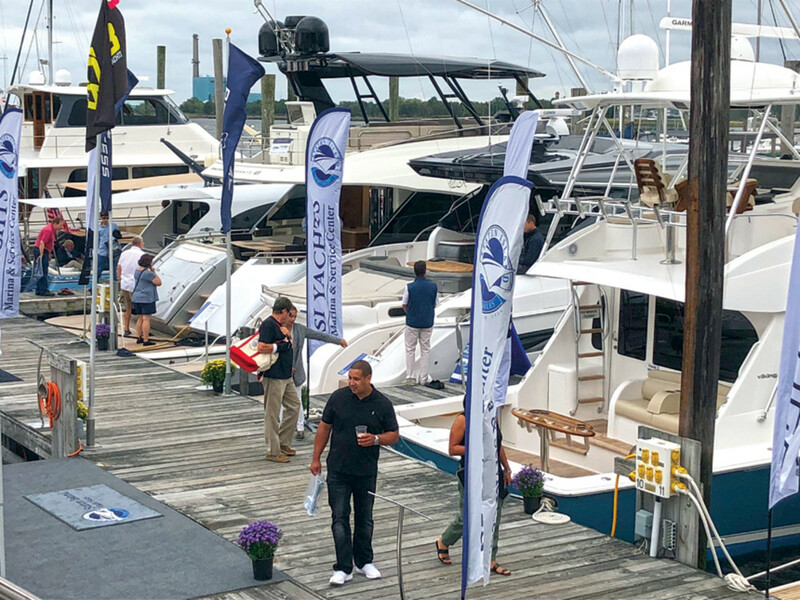 The reduced state sales tax on boats, trailers and engines — from 6.35 to 2.99 percent — helped invigorate sales at this year’s show, says Jon Pritko, vice president of Northeast shows for the National Marine Manufacturers Association. World Cat was working three solid leads from the show — two on a 28-foot dual console and one on a 23-foot dual console, says Chris Lufkin, owner of Maritime Advisors, which represents the company in the region. Technology, such as joystick steering and large-screen electronics, was a selling point for at least one show-goer. “Not being born into boating, the technology makes it so much easier and gives you more confidence,” says Jean Barbaro, who took a test drive aboard Back Cove’s 34O, its first outboard boat. Back Cove national sales manager Jamie Bloomquist was still going over the list of options with the couple as the show closed on Sept. 21. Technology, indeed, has made boating more convenient, but Dante Grover, with Strong’s Marine in New York, worries that it’s pricing some out of the market. “Of course, it’s people that are pushing the market that way,” Grover says. “We just sold a 33-foot Regal bowrider, and the buyer put a Seakeeper on it.” That option runs upward of $25,000. Though the industry has been thriving, a few issues were top of mind for some Norwalk exhibitors. Tariffs were having an impact on materials costs for Formula, but the builder’s fiscal year, which ended in June, was up over the year prior, Porter says. Porter also was concerned about the age of boaters, which averages 56 years old. “Especially since the recession, the average age of owners seems to be going up,” Porter says.